Dude, where's my object? or, Why does Linq not return my object? Once I have the results of my Linq query, I am not always happy. There could be a result that I was expecting to be there but wasn't. For example, my client was expecting that a customer was in a customer list, but it wasn't. It is my client saying "Dude, where's my customer? ", not me. I am the Dude, and to remain a dude, I have to give my client the reason. Is there a simple way to take a given object instance and a Linq query and determine which expressions within the query excluded that instance? //query would return Daniel as you'd expect, but not executed here. First of all, before I attempt to write some fancy Fluent framework, Has anyone done this already? So far, I have considered navigating the expression tree and executing each branch against an IQueryable that only contains my object. Now I don't have a great deal of experience using raw expression trees, so I would like those who have to suggest any pitfalls or even explain whether this is a dead end and why. 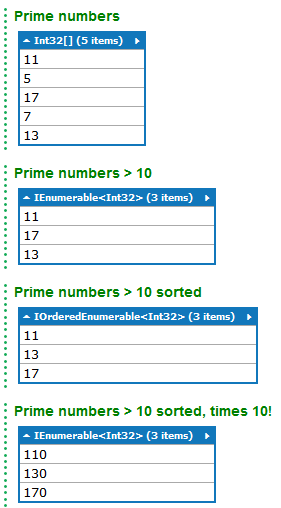 Be Reusable - Should be applicable to any object compared against a Linq query returning objects of the same class. Not affect the performance of the original query (this should just be standard Linq). If there are multiple property values set on the missing instance that excluded it from the results, then all of those reasons should be reported. Also, I would like an indication of whether others might find this useful. If so, I would consider starting an open source project to solve it. With some fun expression hacking, you can see the results of each stage of the evaluation for each item in the set. Inspect the local result after the breakpoint has been hit to see the results of the evaluation. To actually use the results of the evaluation, just append .Where(x => x.IsIncludedInResult).Select(x => x.EvaluationTarget) to the line where the report is generated. I think you'd have to re-create the query as linq-to-objects and deal with the subtle differences between linq-to-sql/entities/whatever and linq-to-objects, accepting that some providers just won't work realistically. You have your object you want to find in an in memory IEnumerable<T> or something. where obj.foo == true && obj.bar == "yes"
you'd have to figure out that obj.foo == true and obj.bar == "yes" are leaves and start there. It'd be a sort of depth first search of the expression tree. So, construct linq to objects queries that only had those leaves. See if the object is included in the results. If not then we've found out why it's excluded, if not then go up the tree (i.e. make the where query include more clauses, getting closer to the orignal one until the object disappears from the results). As I see it the tough parts would be handling the differences between original linq to 'whatever' and link to objects, figuring out where to split the where claues, dealing with things like joins which can also exclude things and dealing with things like SqlMethods.Like that don't work in linq to objects. It's kind of a tricky one, as in, from your example you could always code something to check for specifics and report 'I searched for term x and the object i returned was not in term x'. I would have though as others suggested though, that this would have been along the lines for 'return me x' then in code, run a query for 'x where x.property = y' and report non matches. Following this through, I'd imagine the issue would be that in order to generate the list of non matches, your query or object graph would become pretty massive as you'd need your original object either initially include (or to be expanded via lazy loading to include) many permutations to determine the matches or not. This is kind of the inverse of running a query on the first place where you'd start with an object and sub select based on conditions, you'd want to select and then selectively super select, catching non conditions. It's an interesting problem, and one that I'd normally address either client side or code wise before getting to a point where and object was returned or not. But I guess the perfect solution would be to return a single solution and perhaps examine it's associations for links. The links wouldn't be too hard to find a generic "I've not got one of these" type reason, but to give a 'I've got this link, not that link' response would be harder. You'd need to maybe provide a method based on some form of predicate builder which took a field and search term and returned an appropriate message if things didn't match. In my mind seems like two slightly different problems. I think I follow what you mean. What I think you would want to do is perform two queries, one with selection criteria, and one without, then perform a Linq Except on them to determine which items were excluded, then walk that list and determine what criteria caused them to be excluded. I can't really think of a better way to do it. This would perform a single query (which would have several sub-queries) and only return the results that were excluded (rather than trying to return all results which could be quite large). Unless of course you have a million excluded records and only a few included ones. Not sure how efficient this is, though compared to a way I can't think of. I think you are forgetting that Linq queries do not execute until you call an operation that realizes them. In this example, the database is only hit once, even though there are several linq query objects here. The expression tree is modified without executing the queries. So in this example, when the foreach() occurs, a single database query (with several sub-queries) is executed. Not the answer you're looking for? Browse other questions tagged c# .net linq or ask your own question. In what scenarios would i want to create custom business objects from Linq to Sql results?